I sort of have a reputation for being a tree hugging-fruit leather eating-greeting the sunrise with gratitude hippie. Now, I am the first to tell you I’m really maybe 60% hippie, because I do like shopping at The Gap, eating cheese fries and spending an inordinate amount of time reading celebrity gossip. More often than not, friends and acquaintances choose the “hippie” reference when we’re talking about things like politics and social issues. You should know that we tend to nerd out on politics in our house (but in a cool Jon Stewart/Stephen Colbert way). We never miss a debate. We watch all news coverage. Election season is a major sporting event. Policies, platforms, campaign speeches – it’s exciting. Unless you’re living off the grid (Hippie Level 100), you’re probably well aware that we are entering another Presidential election season (SUPER EXCITING) which means more than ever, these discussions among social circles are occurring. I am not a hippie. I am a Christian. Sometimes I receive comments and criticism from folks with beliefs differing from my own; I am always open to lively discussion and comparison, but I find more and more that my explanation of beliefs is based less on what some interpret as a Liberal POV, and more on me just living my faith. I believe in equality. I believe in fairness. I believe that we are called to help the least and the lost, always. I believe that we are all deserving of forgiveness and grace, and that regardless of past actions, our lives are valuable, full of wonderful potential, and worth living. I don’t believe I have the right to make choices for others; they have their own free will, and I know nothing of their own personal situations. I don’t believe I have the right to judge another person’s morality; that’s the job of my Creator, and I’m fairly certain that He can handle it. (Judging a person’s obeying of the law is not the same as judging or governing their morality). Most importantly, I believe in LOVE. Unconditional, unquestionable, unfathomable love. I serve a God who believes in second chances, clearly evidenced in scripture by those He chose to do the greatest of His work. 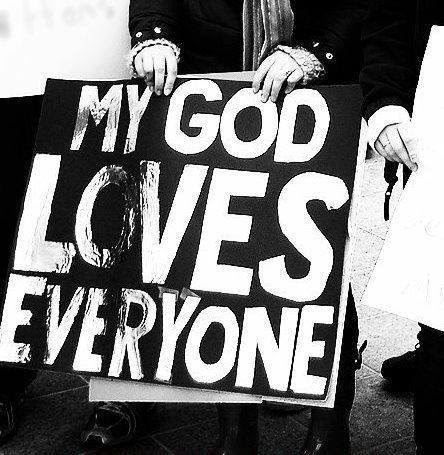 I serve a God who loves us – all of us – equally. To understand the depth of that incredible, amazing and powerful love, consider this: God loves Charles Manson just as much as he loves YOU. Does that thought make you uncomfortable? It shouldn’t; I hope it fills you with hope and peace and awe, because it’s completely true. This doesn’t make the actions of others acceptable, and it does not mean they are condoned, but it does mean that those people would be welcomed with open and loving arms by my God should they truly desire forgiveness and accept Him as Savior. Because he wants us – all of us – to come home to Him. Not a hippie. Just a Christian. kristin at hysterically ever after • This entry was posted in Uncategorized and tagged grace, hippie stuff, love, sometimes i write about serious things. Bookmark the permalink.